Insert a media mashup into the Learn.UQ text editor. Your instructor may specify that you include the audio, or audio and a screencast, via the Kaltura Media Server instead. If so - see the Kaltura mashup instructions below. You may be required to Accept the conditions and Run the application to load the recording tool. 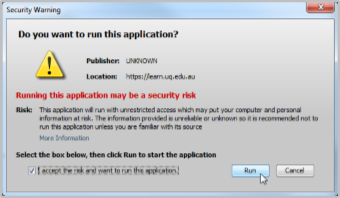 If the application is blocked you may need to update Java or change your Java plug-in security settings as described above. You may be required to accept and run the Java application when viewing the post for the recording playback tool to appear. 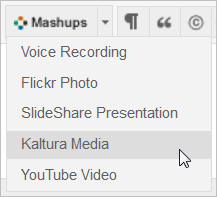 Kaltura content includes videos and audio, recording a video from webcam or recording a screen cast with optional video and audio. Follow the Kaltura upload or record video or audio instructions for using Kaltura. To insert YouTube movies on campus you need to be signed into the UQ Internet Management System. Click the Player Controls button for more options. Close the preview and click on the Select button to embed the video into your content area. Edit the title in the Name textbox if needed. Thumbnail – click on a small image to open the video. Text link with player – click on this link to open the video. 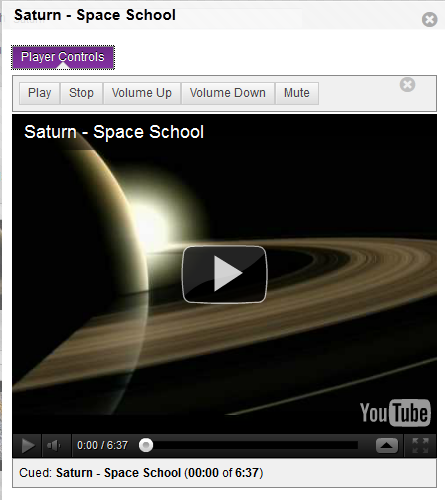 Embed video – a full size video link is inserted into the page. Note: The owner of YouTube video can select to not allow the video to be embedded. It is recommended that you use the Thumbnail option. Optionally, select the Yes radio button the setting Show YouTube URL. Select the Yes radio button selected for the setting Show YouTube information. Tip: Best practice is to include as much information as possible about video. The video will be displayed in the content area.